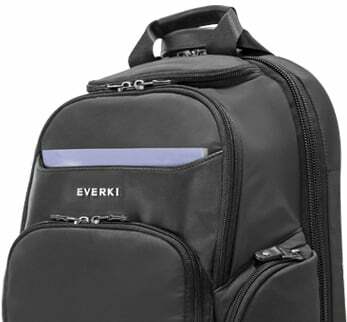 The light and soft material, comfortable feel and minimalistic design of the EVERKI Suite make it the perfect backpack for the mobile professional who wants a bag for a smaller laptop or needs only a tablet for the trip. The soft feel and subtle classic style on the outside of the bag doesn’t minimize the hard-working organization you’ll find on the inside. The Suite backpack is the softer side of our classic Versa backpack. 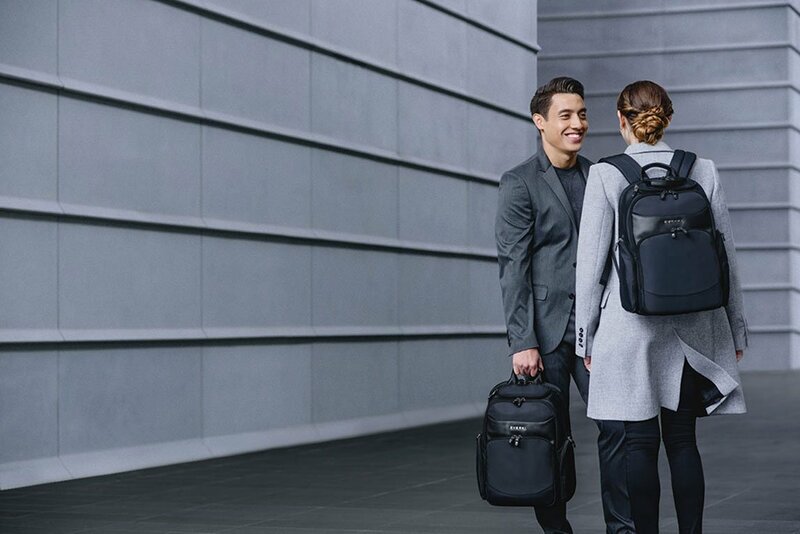 Decidedly lighter and more relaxed than the Versa, the Suite is the perfect backpack for mobile professionals who are looking for a smaller, yet highly functional, executive bag. Made with light-weight nylon taffeta, the Suite is the Versa’s sophisticated sibling, sporting classic details like high quality leather accents on the face, handles and pulls, and structured sidewalls that stand up when you set the bag down. 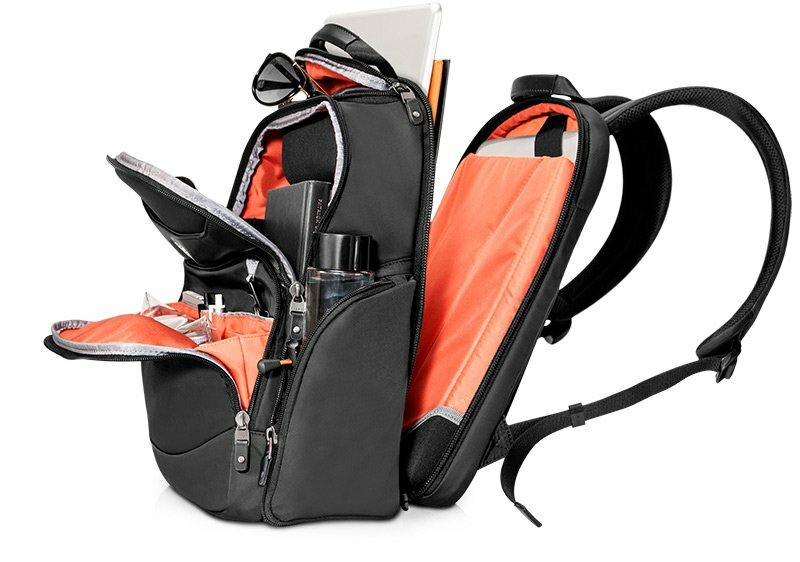 This compact backpack is perfect when you’re toting just a tablet or small laptop, and the RFID-protected pocket and organizational capabilities make it a great carry-on for business travel, as well as for carrying into the boardroom. The Suite – minimalistic in style, robust in function. The Suite backpack embodies the intuitive design you’ve come to expect from an EVERKI bag, wrapped up in a soft and comfortable exterior. But don’t let the nylon taffeta, relaxed feel and minimalistic profile fool you – this backpack is made to function. 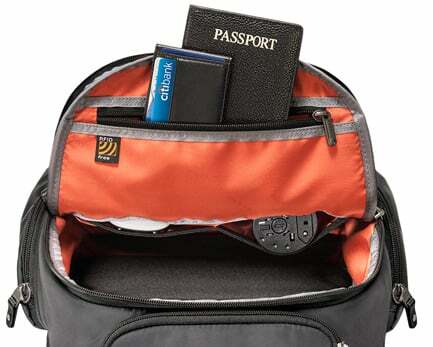 With individual pockets that fit up to a 14-inch laptop and a 13-inch tablet, Checkpoint Friendly design, a trolley handle pass-through, and two elastic pockets to hold accessories such as a mouse or portable charger, the Suite is the perfect companion for travel or business commuting. You’ll also find premium features like the hard-shell sunglasses case, the patented corner-guard protection system, and an RFID pocket. The Suite is light to the touch, yet loaded with capability. The laptop and tablet technology compartment in the Suite is the epitome of security and efficiency. The laptop pocket keeps up to a 14-inch laptop safe with our patented corner-guard protection system, super-soft felt lining, and stationary security strap. The tablet pocket holds up to a 12.9-inch iPad Pro safe and snug with a strap and super-soft lining. And, the Suite is designed with our hassle-free, 180-degree fold-out design to make passing through airport security a breeze. You don’t have to remove the laptop or tablet from the technology compartment; simply open up the backpack, lay it flat, and your bag will quickly pass through the scanner. Are your sunglasses or reading glasses a traveling necessity? Then you definitely want them protected inside your bag. EVERKI’s unique hard-shell sunglasses case was designed specifically with this in mind. There is plenty of space in the built-in hard case for your sunglasses or reading glasses, as well as an additional nylon tuck-away for your phone or ear buds. And because it’s positioned on the top of the bag, you won’t have to fumble around looking for them when you need them. Your glasses are safe, secure and right at your fingertips. When you travel with your backpack as your mobile office, your laptop has to be securely protected. That’s why we’ve engineered the Suite with extra padding in the lining of the laptop pocket and molded-to-fit laptop corner-guards. 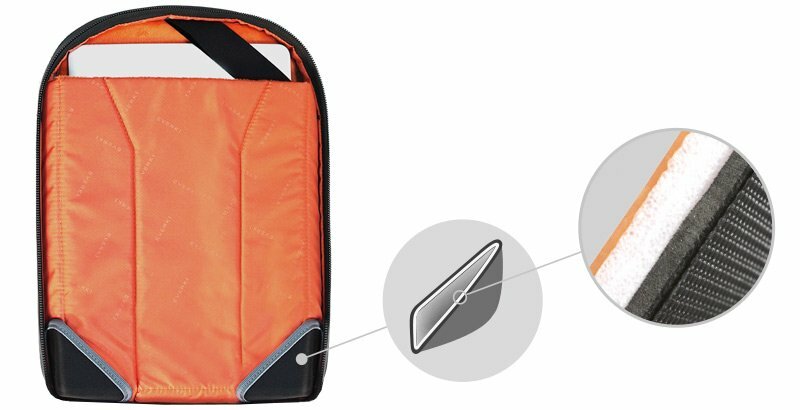 Our patented corner-guard protection system uses form-fitting corners to wrap snugly around the bottom of your laptop pocket to protect against knocks and bumps – or if you accidentally set your bag down too abruptly. 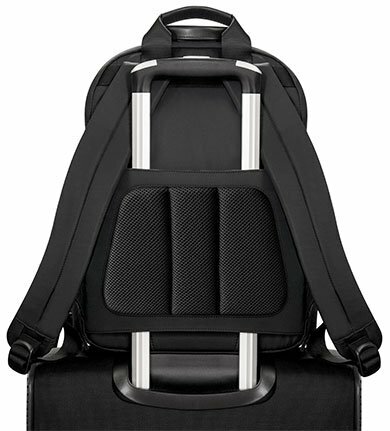 The shock-absorbing system of the Suite will give you Peace of mind, knowing your laptop is safe inside your bag. Carrying passports or credit cards with microchips may make you vulnerable to illegal remote scans. So we designed the Suite to protect the sensitive data on your passport and credit cards with an RFID-protected pocket. Simply slip your sensitive items into the secure pocket, and your information is safe from unwanted RFID scans. We designed the Suite with a quick-access magazine slot to easily slip your reading material right into the bag. The slot is placed at the front of the backpack so you can stash your magazine when boarding, and quickly retrieve it again when you’re seated. The Suite – brimming with thoughtful details. When traveling with many bags, the trolley handle pass-through on the back of the Suite allows you to double your efforts. Simply slip the bag onto the handle of your luggage and you’re ready to wheel through the airport. 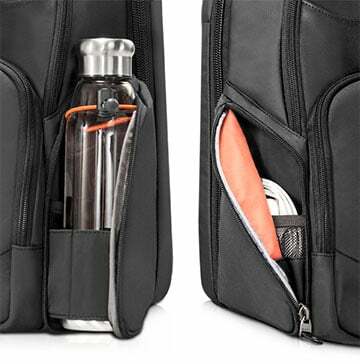 The two side pockets on the Suite allow you to safely secure your water bottle with the elastic loop, or stash accessories such as chargers and adapters. Plus, they’re fully zippered for a sleek and sophisticated profile. 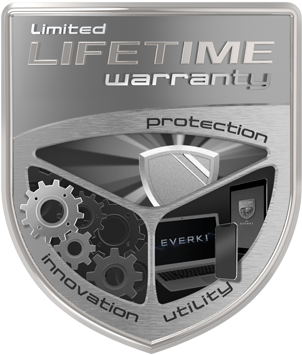 Well, I have been an Everki fan for quite some time, and I probably sold so many of these things because of my experience. This is my second backpack with my first being the Versa. I purchased the Suite as my Versa was aging and I wanted to reward myself for the holidays. To be fair, I wanted to share the pro and cons of this backpack. Pro: Smaller & Lighter that the Versa. Material Easy to Clean. RFID Protection. Con: Quick-access magazine slot: When putting something in this slot it often gets obstructed by whatever is behind the pockets. The Versa was lined inside with a ridged back to prevent this issue. Con: Zippers can’t freely open with one hand as the zipper gets obstructed by bends in the material or the spacing between the zipper and material doesn’t have enough distance apart, and it gets caught up. If you can live with the extra 1.25 pounds of weight, then hands down the Versa is better and its lower in cost. If a lighter bag is important and you can live with cons and the smaller bag then get the Suite. This is an excellent compact backpack. I also have the Versa, which I also love. This is smaller than the Versa and made of higher end materials. It is great when I want a small backpack that still holds a lot. I can fit my laptop, my iPad, and an electronic notepad in the back compartment with plenty of room in the front compartments for headphones and computer accessories. It holds an incredible amount despite its small size. The quality is excellent and the material luxurious.